I was going to write a book entitled "The Second Sleeve: Memoirs of a Knitter." Perhaps it will be a compilation of thoughts found on the internet instead. There's this store in Seattle called the Weaving Works. It is an exceedingly good store and anyone who hasn't been really should go. I drive many many miles out of my way to get there its so good. Anyway, aside from just yarn they have roving and cones for spinning and weaving. These items take up a good third of the store and while I always knew they were there I always thought of them as things for spinning or weaving. Not so my friends, there is no rule that say you have to be a weaver to buy yarn off the cone. The beauty of this is that you can buy just a little bit of yarn, say $0.42 worth any have more than enough to knit a swatch and see if you like the yarn and how it works. Buying off the cone also means you can buy small amounts of many colors and create whole projects, providing morre money for future projects and less leftover yarn in colors you don't really like because the project was a gift for someone else. Today I bought some linen and some cotton/linen blend. I spent about $5 on the whole lot and have three different yarns to try. The downside is that I have now begun to discover the glory of yarn on the cone and will have to amp up my efforts to find a wealthy husband/sugar daddy/benefactor so that I don't have to work and can spend all my time knitting. Am I the only one that sometimes finds yarn stores depressing? I go in with nothing in particular in mind and a recently deposited paycheck sitting in the bank. Then, on every wall I find yarn I want to buy for a million different projects. Then I think about all the yarn I have at home and the unfinished projects and I get depressed that I simply don't have enough time to do all the things I want to do. This really only happens when I go to the yarn store without a clear project in mind, but it sometimes hits when I am mid-project on a few things and with I could just finish them now and start something else. It is for this reason that I am not much of a stasher, I actually find it depressing to see all that yarn sitting there unused, just waiting; it bogs me down with all its expectations of glory and a life outside the stash. I am a blend of a process and product knitter, so while I enjoy the process I also want the product, which means I find it hard to start a project and just leave it unfinished. I have one such sweater now, a Dale of Norway sweater, that I love and desperately want to wear. I just have to be bothered to finish it. Then when I do I can go get some of those fabulous Norwegian clasps I saw today that reminded me of my unfinished sweater and how much I want to finish it so I can get those clasps so I can wear it. Bah. It's bogging me down, but then I have so much else I want to start, finish and wear. Truly a horrible disease, to not go into and come out of a yarn store in a good, woolly mood. At least I'll get to try this whole linen thing and see if it's for me. I also got the Second Book of Modern Lace Knitting by Marianne Kinzel that has a fabulous doily on the front. Luckily I now know that I can just get the yarn for any project in the book off the cone. Or in one humongous hank of alpaca or other delightful lace weight. A whole new world of yarn opened up and not enough time in the day to do it all. I've gone back to the colors I started with, and I think its going to work. I'm going to knit from both end of the Wild Tide in an effort to break up the pooling, we'll see if its more work than its worth. This time, though, I did a swatch. 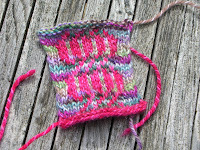 I then blocked the swatch and spent a long time looking at it. I set it up so I would see it when I walked in the room. I went away for the weekend and thought about it. I didn't actually obsess that much about a hat, but I do like the swatch, so hopefully I'll like the hat. The hat didn't make it through the night, it was just too ugly. Cause of death was stated as lack of brightness. The orange needs to be more orange peel and less orange sherbet. A swatch with red replacing the orange has been made, but the void caused by a lost project cannot simply be filled. The grieving process must be observed. So I have this yarn. Specifically Walking on the Wild Tide and Sunstone in Silkie Socks that Rock from Blue Moon Fiber Arts. I was so excited to make the Syncopated Cap from the newest Interweave with this yarn. I love how the orange goes with the bold colors of the Wilde Tide. I could stare at my two lovely cakes of yarn sitting next to each other and it would never get old. Enter the problem. They look pretty terrible all knitted together. Really terrible. Enter the options. I can carry on, and hate the hat and never wear it. I can rip it out and try knitting with both ends of the wild tide switching every row, or I can use the wild tide with the red I originally bought to go with it. I am leaning towards using both ends of Wild Tide, mostly because this means I don't have to rip out my lining and neat hem. The hat lives another day. In the meantime I will anxiously await the arrival of my next sock club installment. So my mother has this new kitchen. After 30+ years of living in the same house my parents have come to terms with the fact that they aren't moving. Thus they are remodelling. The short of the (very very) long is that the kitchen is finally finished. When you get a new kitchen many things carry over. It would be silly to buy all new dishes and silverware etc. when the stuff you have is perfectly suitable for your new kitchen. However, there are some things that simply should not ever set foot in the new kitchen, ever. These include my mother's old potholders. I don't have a picture, but they were bad, and pretty old. I was the self-elected one to make these potholders. Really I was looking for something quick, easy and fun. Instant knitting gratification. Let me say, instant knitting gratification is exactly what I got. I think it took me 2 or 3 evenings to knit them, and one short session to felt them. Voila, new potholders, some stash yarn used, finishing a project, and, best of all, being able to give my mother new potholders the morning of a big family party in the new house. Ask me how hard it was to find yarn that would match the general color scheme of the kitchen and the house in my mother's yarn stash. Well the answer is not hard at all, I didn't even use all the yarn I found that would have worked. I forgot to mention that I did a star toe, not the one written in the pattern. I liked how the star toe added yet another swirl to my swirly girly socks. What is swirly, and girly, and so full of goodness it keeps your feet warm? My new pair of socks! Notes: The pattern is actually for socks that come up to the knee, but I didn't have enough yarn for that, nor did I want socks that high. I started with 72 stitches (conveniently the number I was aiming for and a multiple of both 6 and 8) and did the top of the sock as written then leapt into the ankle pattern, skipping the patterns for calf and leg. I also did the heel flap over fewer stitches and the sole over two fewer stitches than called for in an effort to have enough yarn to finish. Finish I did with 6 grams left over. This pattern eats more yarn than your average sock so beware. I did a cable cast on instead of my usual knit cast on and I think I may be a convert. My usual knit cast on is stretchy enough for the top of a sock but it always leaves the first row looking a little wonky and loose. The cable cast on, however, is stretchy enough for the top of a sock but is clean and refined and everything the knit cast on is not. 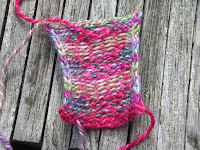 I love how the stitches spiral one way and the colors spiral the other way. I briefly debated making mirror image socks and having one spiral to the left, but in order to get the spiral you have to shift one stitch over your needles every other row. This is not difficult when you start knitting with a new needle before the old one is finished, but it is very tedious when you want to shift the stitch the other way so I gave up on that idea. The best part about these socks is that I drive by them every day on the way home from work. I don't have a picture because it is beside a freeway, but there are a couple hills on my way home that are nature's equivalent of these socks. All the same colors exactly, it's almost freaky. In the race to finish the back of my third and final wedding pillow before the yarn I won, but only by 4 grams. Notes: I did the pattern basically as written, except for the yarn. I don't know why I didn't do the whole thing in mohair, but for some reason I thought this would be a bad idea. As it is I enjoy the big block of mohair in the middle, nice and soft compared to the Lamb's Pride. I worked the big blocks of color in intarsia and duplicate stitched the filigree on later. I had to block all the parts of this project very severely to get them to the 16" square that the pattern calls for. I could have probably used a 14"x14" pillow and not have the somewhat overstretched look I have. As it is though I think most of my problems with these pillows are ones that only I notice as their creator. My brother and his fiancee will probably not notice any of the things I do. If I were to do these again I would either use a larger gauge yarn or not block as severely, I had to cover the pillow forms with dark brown fabric to keep the white from showing through. This was my first time knitting with mohair in any real amount and I was a bit nervous about how it would go. I don't know why, but sometimes you just get ideas in your head. Anyway, I have since worked with mohair more and I am kind of in love. I want to make everything mohair and only knit things with a lovely mohair halo making it warm and fuzzy. My favorite is the one with the red border, followed by the orange border with the blue border coming in last. I started with the red border, and then when I realized I would have enough yarn to make three I rotated all the colors through. I think the problem with the blue border is that there isn't enough contrast within the pillow itself, the red and orange blend together and the blue diamond sticks out. Alas, what can you do and still preserve the color rotation? Today at work instead of working on the second of my swirly girly socks I read The Knitting Circle by Ann Hood. I didn't finish, but I'm over half way and so far its pretty damn good. The only part I can truly relate to is the knitting, as it is about a woman who lost her child and seeks solace in knitting, but I'm still totally engrossed. Not an upper, but not as much of a downer as one might imagine. So far I would recommend it. As I have nothing to say about knitting today (only very boring wedding knitting happening) I am going to hijack another meme and tell 7 random things about me. 1. I mistype my name about 40% of the time, by now it is muscle memory to mistype my name. In my defense my name is 17 letters long, which is a lot. 2. I had never purchased black clothing for anything other than a band or orchestra concert until last year. The only times in my whole life that I have worn all black was for a band or orchestra concert of some sort. On occasion I put on all black, look at it and change something. 3. I am something of a professional seasonal employee. Since graduation I have not had a job that lasted more than 5 months and I have not lived in a single place more than 5 months. Except for right now, I am on month 2 of a seasonal job, but month 7 of living in the same spot. There is no moss under my feet. 4. I play the bassoon and I recommend that everyone force their child to play some sort of instrument at least through high school; the rarer the instrument the better. I got a lot of money to go to school and play the bassoon, but I firmly believe that if I played the flute I wouldn't have gotten any money, or not nearly as much. 5. Once in the summer between 5th and 6th grade I rode my bike from Seattle to Portland. There is this annual bike ride called the STP (Seattle To Portland) and my family was really big on bike riding so I rode my bike from the King Dome to somewhere in downtown Portland. It took two days. There were lots of people passing me on the second day that had little blue stickers on their numbers indicating that they were doing it in one day. 6. When I rule the world there will not be mandatory military service, but there will be 2 years of mandatory customer service. Before the age of 30 or so every last person will be required to spend two years waiting tables, serving coffee, or answering phones. I firmly believe that this will lead to politer people and less useless complaining and outright rudness. 7. I hate bobbles. I have only done one project with bobbles and the only texture in the entire thing was bobbles, it was allover bobbles. Thus the bobbles lost their horrible bobble-ness. I don't mind the making of the bobbles, I actually kind of love it, I just really hate the look of bobbles. Something is wrong with our computer at home (I'm at the library right now) and the internet isn't working, which is why I haven't posted in a long time. I did however add pictures of my second first yarn and singles. The Odysseus sweater continues. We are currently chilling out with the Lotus Eaters, not a lot of progress, but no regress either. Penelope is waiting patiently (ha) and has hopes of Odysseus making it home before the big family wedding in 2 weeks. Penelope has been informed that her hopes are mostly in vain, but she shouldn't give in and marry any of her suitors yet. I've finished the front and back of the wedding gift pillows. I was pretty sure I was going to have enough brown yarn, but not positive. I finished the front and things looked okay, but not terribly hopeful. I cast on for the back thinking there wasn't much for it either way and carried on. As I neared the end of the skein, and counted rows constantly I got more worried. In time honored tradition I knit faster in a desparate attempt to beat the yarn to the end, and luckily this time I won. I even have enough to seam the thing together with some to spare. Turns out I had nothing to worry about the whole time. Man oh man, to sound interesting and poised.